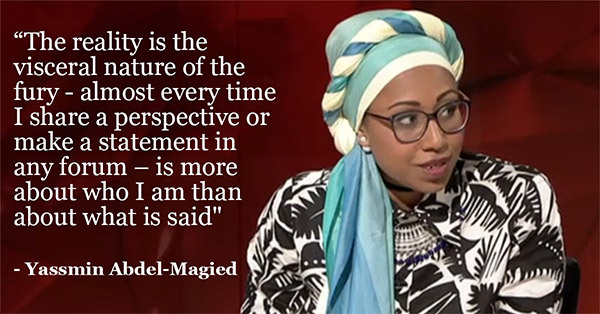 Yassmin Abdel-Magied describes herself as the “most publicly-hated Muslim in Australia” — thanks in no small part to a Holy War conducted against her by The Australian. For someone who is a casual ABC presenter, engineer, writer, and activist, the paper’s coverage of her every move has been frenetic. The first round of attacks was prompted by a comment from Abdel-Magied on the ABC’s Q&A in February saying that Islam was the most feminist religion. The Australian took offence, and turned Abdel-Magied into a fresh target. So, when she posted a statement on Facebook on Anzac Day saying: “Lest we forget (Manus, Nauru, Syria, Palestine)” (which she quickly deleted and apologised for) The Australian was off and running — almost 12,000 words have been written about her in the paper since that post. The paper hounded the ABC about whether she would be sacked, covered her talk to students at a Sydney Writers’ Festival event, and launched a barrage of criticism against her July op-ed in Guardian Australia about her experience in the public eye. As the Holy War against Abdel-Magied ramped up, it included a page-three story she had posted on Facebook about a discount code on glasses, and stories about a “taxpayer-funded” trip to the Middle East and her role on the Arab-Australia Council. Then came a front-page pointer when she announced she was moving to London. And, in early August, there was another page-three story dedicated to her quitting as chair of the Arab-Australia Council — reported as “losing her place” — because she was moving overseas. Most recently, yesterday, the Oz reloaded the guns, censuring Abdel-Magied, and dubbing her the “Queen of Bad Timing”, for comments she made on Twitter about the recent terror attack in New York.